The check-raise is a risky strategy, but it has the potential to instill fear in your opponents and give you the upper hand. This particular move occurs when a player checks and raises in the same round. It is a fairly aggressive move, which some people compare to an early bluff, and should be used sparingly. In some cases, players will use the check-raise strategy to force other players to be more aggressive than they normally would. In other words, a player in an early position might check to force a player down the line to raise in a situation where he or she might not have done so. This is most effective when you are sure that such a player holds a weak hand. Check-raise strategy can also simply be used to intimidate other players. This is why the move is not popular with some players, as many find it unnecessarily aggressive and distracting. Still, it can prove to be effective in diminishing a player's confidence, which (in contrast to the forced bet strategy) can prompt them to play more passively, allowing you to raise a bet when it comes back to your turn. Keep in mind that check-raise strategy is actually forbidden in some games, typically those in which the stakes are lower. 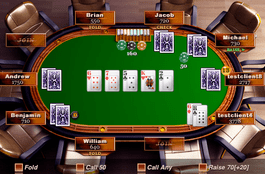 Generally, however, it is permitted in mid-to high-stakes no limit Texas Hold 'Em. Still, to be truly effective, the strategy should be deployed only when absolutely necessary.